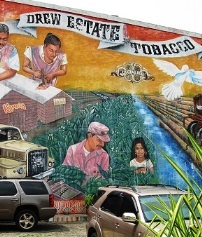 1) For the third time in three years, next week StogieGuys.com will be on location at Drew Estate’s Cigar Safari. The four-day pilgrimage takes place in Estelí, a city in northern Nicaragua that has become a mecca of tobacco cultivation and premium cigar production. Its prominence in the industry has grown considerably in recent years; imports from Nicaragua grew 15% in 2013—an achievement that has the Central American nation on pace to surpass the Dominican Republic as the largest provider of premium cigars to the U.S. market. Patrick A and Patrick S will once again be on hand to learn from cigar icons like Jonathan Drew, visit tobacco processing facilities, walk cigar factory floors, and get a behind-the-scenes look at one of the industry’s most exciting companies. And, of course, we’ll return with lots of content and information to share with you. Before we depart on Sunday, feel free to leave comments on this post with any questions you’d like us to ask while we’re there. 2) La Palina’s “Mr. Sam” is transitioning from an 850-box limited run to a regular production series in the La Palina portfolio. Crafted in Miami at El Titan de Bronze with an Ecuadorian wrapper around Nicaraguan tobaccos, it will be offered in three vitolas: Corona, Robusto, and Toro. The line is named for Samuel Paley, who founded La Palina in 1896. 3) Inside the Industry: Nicaragua took another step towards surpassing the Dominican Republic in cigar imports to the United States. According to Cigar Association of America numbers (published first in Cigar Insider) Nicaragua produced 15% more cigars in 2013 than it did in 2012. Dominican production was flat, while Honduras was down slightly. If the rates of growth remains the same in 2014 then Nicaraguan would surpass the Dominican Republic. 4) Deal of the Week: The Stogie Guys Sampler at Corona Cigar Co. was recently updated. Just $30 gets you 7 cigars, including an Undercrown and the limited Avo Lounge cigar. It would be great to get an update on the Velvet Rat from the DE crew while you are down on the cigar safari. Thanks and and have a great trip. I'd like to hear if the folks down there are at all fearing another cigar bubble burst, or if there is a Nicaraguan bubble that's going to burst. Cigar imports to U.S. are highest since the bubble. And 15% increase from Nicaragua between 2012 and 2013 is really fast growth. By the way, how much of this growth is attributed to Drew Estate alone?